All fun trips must come to a close! – RV Cheaper! December 5, 2012 January 8, 2015 RV Cheaper! All fun trips must come to a close! With all of the mechanical issues causing us to get out of Florida so late, we had to hustle home after Poche’s RV Park. After Louisianna, we only stopped at highway rest stops to catch some sleep on the last leg of the trip. When we got home, I managed to get the emission test done so I can get the title and registration done on Monday. I also manage to get a slot in a nearby RV lot. We will keep the RV in Chandler for winter camping, then head up north and store in Payson for the summer camping season. 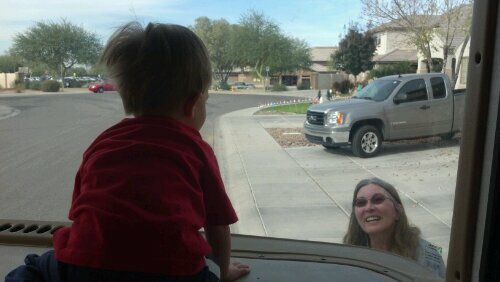 Our Grandson Brayden approves of the new RV and had fun on the huge dash! Next a present from the winds of west Texas!